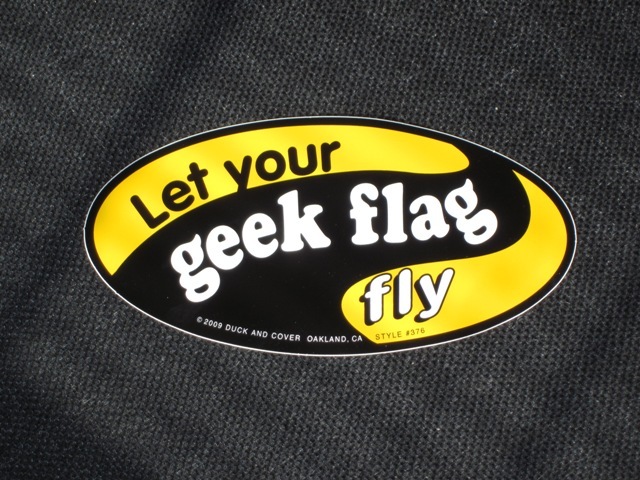 I picked up a new bumper sticker this week – LET YOUR GEEK FLAG FLY! I love it! I bought the sticker at Lofty Pursuits. I can’t seem to find it for sale on the internet, but if you go looking it was produced by “Duck and Cover”. I’m still deciding whether to slap the sticker on my new Jeep or my laptop. The phrase is a play on words from an old Crosby, Stills, Nash and Young song, “Almost Cut My Hair”, in which they sang the line “Let your freak flag fly”.